Georges Pierre Seurat, born December 2, 1859 in Paris, France - died March 29, 1891 in Paris, France was a French artist painter. 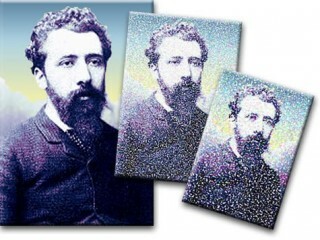 The French painter Georges Pierre Seurat was the leading figure in the neoimpressionist movement of the 1880s and in the development of the technique of pointillism. The impressionist style, which marked a radical shift in the course of Western painting, blossomed for the most part in the 1870s. During the next 2 decades a number of young painters sought to work out the tenets of impressionism in terms of their personal styles. These artists are generally separated into two groups: the postimpressionists, which included Vincent Van Gogh, Paul Gauguin, and Paul Cézanne, and the neoimpressionists, which included Georges Seurat and Paul Signac. In particular, Seurat wished to carry the theories of impressionism to their logical conclusions and to establish an art with a truly scientific base. Seurat was born in Paris on December 2, 1859. As a student, he worked in the school of the sculptor Justin Lequien, and, for less than a year during 1878-1879, he studied at the École des Beaux-Arts. During these years Seurat developed a deep respect for antique sculpture and Renaissance painting. In terms of his own century, he particularly admired the painting of J. A. D. Ingres, and he made a careful study of the new landscape tradition that had begun with the Barbizon school and culminated in impressionism. But Seurat was interested in science as well as art, especially in scientific color theory. During the late 1870s and the early 1880s he read numerous treatises on this subject, including those by M. E. Chevreul, H. von Helmholtz, and O. N. Rood; he also studied Eugène Delacroix's writings on color. Essentially, Seurat's aim was to separate each color into its component parts (this process is known as divisionism) and to apply each of the component colors individually on the canvas surface. In order to have the colors blend optically, each one had to be applied in the form of a small dot of pigment. The phenomenon whereby colors were allowed to blend optically instead of being mixed on the palette had been the discovery of the impressionists, but Seurat carried the process further. He analyzed it scientifically and developed a theory to explain it. The term "pointillism" refers to the actual application of these theories to painting. Seurat's first major demonstration of pointillism was A Sunday Afternoon on the Island of La Grande Jatte (1884-1886). This is also his most celebrated painting. A large work, it is extremely complicated, consisting of numerous figures scattered both across and into pictorial space. The scene itself is typically impressionist in presenting an outdoor world. Yet the work departs radically from impressionism: it was painted entirely in the studio with each of its many elements being carefully calculated in terms of color, light, and composition. La Grande Jatte is thus a tour de force in revealing Seurat's painstaking method: like his academic predecessors, he made careful studies for each figure. As a result, each seems frozen in its position, but each scintillates because it is composed of a myriad of individual color spots. As a whole, the painting is at once both classical and modern. Seurat, Signac, and Odilon Redon were instrumental in organizing the Société des Artistes Indépendants, which had its first exhibition in 1884. Like the impressionists before them, these artists originated their own shows because their radical art had been rejected by the juries of the official Salon. And although these shows contained a wide variety of individual styles, Seurat's ambitious demonstrations of pointillism clearly established him as the major figure of neoimpressionism. Between 1886 and 1890 his influence thus spread to numerous other painters, including Gauguin, Camille Pissarro, Van Gogh, and Henri de Toulouse-Lautrec, all of whom went through pointillist periods in their own work. After completing La Grande Jatte, Seurat consciously sought to expand the expressive range of his work. He became interested in motion and in the emotional quality of linear rhythms. Seurat's friend, the esthetician Charles Henry, encouraged and shared these interests, which are reflected in La Parade (1887-1888), La Chahut (1889-1890), and the Circus (unfinished). In contrast to the formality of La Grande Jatte, these works contain moving figures, sparkling lights, and a generally lyric atmosphere. In spite of this expanded content, however, Seurat did not relinquish his methodical, scientific technique. He continued to work slowly, carefully developing his theories and producing numerous drawings and oil studies for each painting. Because of his painstaking working process, Seurat completed relatively few major paintings. Throughout his life, however, he was a tireless and consummate draftsman. As a student, he made drawings of classical sculpture, architectural motifs, and the human figure. Many of these are reminiscent of the touch and style of Ingres. But by the early 1880s Seurat began to evolve a more personal style, generally employing Conté crayon and an unusually high-grain paper. The range of feeling in these drawings is extraordinary--and occasionally surprising in comparison to the rather cool tenor of his paintings. The master delicately used his materials to suggest figures, spaces, and atmosphere; frequently he allowed the grain of the paper to show through the Conté crayon and achieved a sense of quiet intimacy that has few parallels in the history of the medium. Early in 1891 Seurat contracted infectious angina. He died on March 29 at the height of his artistic powers. View the full website biography of Georges Pierre Seurat.